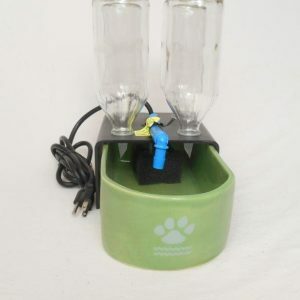 The High Capacity Pet Fountain with Chiller provides a long lasting and safe water supply for your large dog or multi-pet household to prevent development of health problems, especially kidney disease and urinary tract infections. • Thermoelectric Ice Probe™ Chiller uses the Peltier principle to transfer cold through a solid aluminum probe to the water in the basin resulting in water temperature that is about 15°F. below ambient (room) temperature. (See this link to understand how it works:http://www.novatecproducts.com/iceprobe.htm) The IceProbe® is powered by a separate 12 volt D.C. power supply and draws less than 50 watts. • Adjustable, long lasting, and quiet professional grade submersible fountain pump with 6-foot long grounded (3-prong) electrical cord provides safe use of electricity to prevent accidental electrocution. 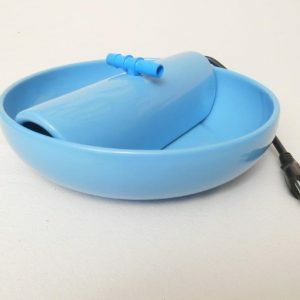 The High Capacity Fountain uses a more powerful pump with a higher capacity (260 GPH compared to 70 GPH for Basic/Perfect Fountain pump) due to the increased volume of water being circulated in the High Capacity Fountain. 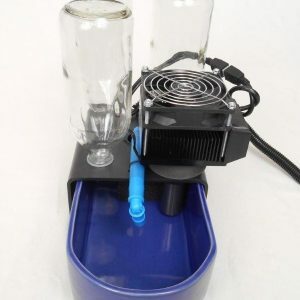 • In-Line Charcoal Filter made from sterile pharmaceutical-grade tubing with NSF Water-Safe Charcoal (granular activated charcoal) to trap impurities as water is forced through the tube. The antimicrobial protected tubing is extruded with an inner liner that releases silver ions to protect against colonization by pathogenic bacteria. Silver ions also inhibit the growth of biofilm forming molds, fungi, and algae. No toxic plasticizers, DEHP or phthalates are used as additives in the manufacture of the tubing and fittings. In addition, the tubing and fittings are free from PVC, Bisphenol-A and animal derivative components. The tubing and fittings meets European REACH and RoHS requirements and will not emit toxic chemicals if incinerated. Larger size tubing and charcoal due to greater volume of water in this fountain. No recharge option for this filter. 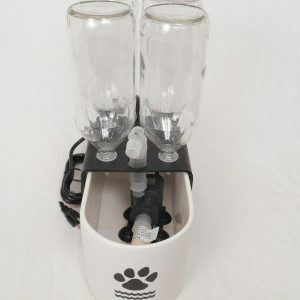 • “Sock type” foam pre-filter to prevent pet hair and debris, including saliva, from being sucked into the pump, increasing time between pump cleanings and improving pump longevity. • Medical-grade black ABS plastic bridge with 3 plastic Cap/Spout Combinations to hold glass refill bottles. 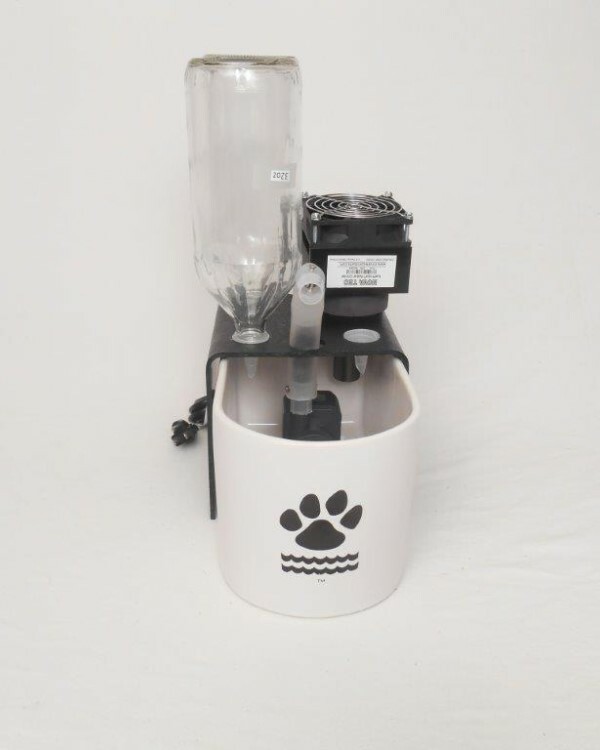 (Ice Probe™ Chiller is attached at 4th hole position, reducing refill bottle capacity to 3 32-oz bottles.) 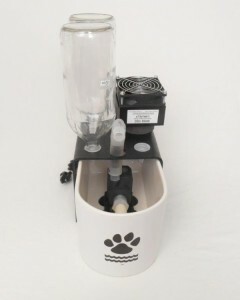 Bridge with attached pump and filter component system easily lifts off Ceramic Basin for easy cleaning and water replacement.